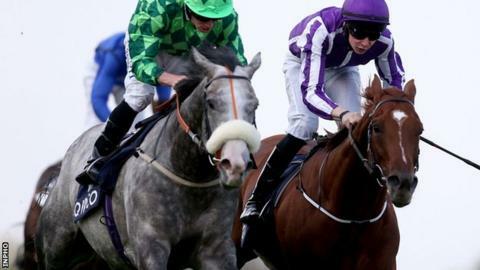 Dual Derby winner Australia was handed a shock defeat in the Irish Champion Stakes as British-trained The Grey Gatsby took victory at Leopardstown. The Epsom and Irish Derby winner took the lead in the final furlong but the French Derby winner, superbly ridden by Ryan Moore, got up to win by a neck. The Aidan O'Brien-trained Australia went into the race as a 3-10 favourite with The Grey Gatsby a 7-1 shot. Australia had beaten The Grey Gatsby in the Juddmonte International at York. "The Grey Gatsby's trainer Kevin Ryan was a little tetchy in midweek at media questions suggesting that it was perhaps bold taking on Australia again after they were beaten two lengths by the colt at York. "Ryan was convinced however brilliant Australia was supposed to be, hoping to turn the tables was no pipedream, and at the end of a genuinely thrilling finish how he right he was. "It's fair to expect that Australia's rider Joseph O'Brien may get some stick for racing wide and getting to the front too soon, but the winner was again showing what a high class presence he is in a very decent year for three-year-olds." There was no hurry during the early stages, as Australia's pacemaker Kingfisher and the Hamdan Al Maktoum pair Alkasser and Mukhadram formed a leading pack. Australia's jockey Joseph O'Brien was forced to go quite wide around the home bend, while Moore saved ground on the inner and used that momentum to take him on to secure yet another major success. Winning trainer Kevin Ryan said that he went into the race convinced that his horse would "go very close" to upsetting the odds-on favourite. "Richard Hughes [The Grey Gatsby's jockey in the Juddmonte International] said at York that Australia just got first run on him," said Ryan. "On the day I don't think he would have beaten him, but Hughesie thought he would have been a lot closer and given him a harder race. "Today we had him in a little bit better shape as we were always conscious of this race. "Turning in, I was thinking he had a lot of ground to make up, but in fairness to Ryan he was saving ground while Australia had to go wide." Ryan said that The Grey Gatsby will not compete in next month's Prix de l'Arc de Triomphe at Longchamp but could be aimed at the the Champion Stakes at Ascot two weeks later.